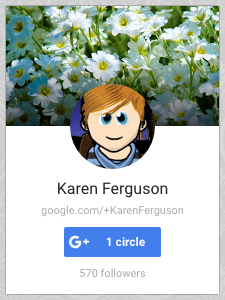 Karen Ferguson is a Teacher of Digital and Visual Communication at Tamaki College in Auckland, New Zealand. She recently presented at the 2016 Auckland GAFE Conference on the subject of using Tinkercad/3D Printing. The presentation was originally posted on Stuff and Nonsense her professional learning blog. You can click on the link here to the presentation. 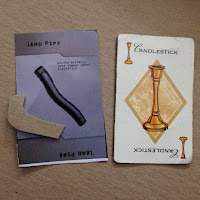 Learning Challenge: To replace missing pieces of a game to ensure that the game is playable. As part of the classroom resources there is a pack of 'wet lunchtime games'. The purpose of these games is to ensure that the students can be occupied during times that the weather prevents them from going outside. Some of the games have smaller game pieces that are plastic that overtime have been lost. Some of the game pieces had been replaced by cardboard cut outs of various pieces (see right) - however the students when brainstorming ideas about using the 3D Printers in the classroom they felt that the could reproduce the pieces better and in more detail using the 3D Printers. Background: This task enabled the classroom of students to be involved in a straightforward task. There were six items altogether that needed to be recreated, which meant that we had three to four students in each group. In the first instance we looked at replacing the items with the original game pieces - these could be done relatively cheaply however we wanted to incorporate the technology. We looked at Tinkercad to see if someone had already produced them - and couldn't find the existing regular items but did find a version of it. However this didn't align to the existing cards that were produced with the games. It meant as a consequence that the game couldn't have been played with the existing game cards. 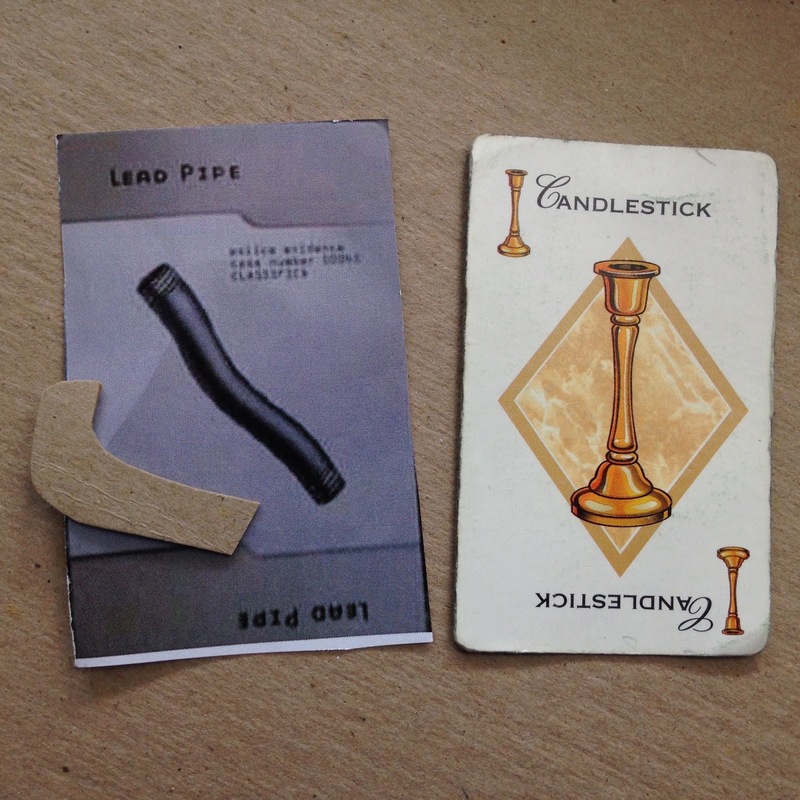 Task: Students had to design the game pieces and 3D Print them to replace the following items: rope, lead pipe, knife, spanner/wrench, candlestick or revolver. These would be the size that would allow them to be used as replacement parts in the game. 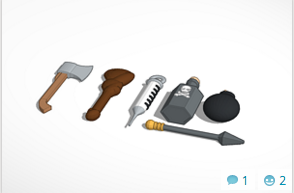 Level of Difficulty: Some of the weapon items were straightforward - such as the lead pipe. The more difficult items such as the revolver were extremely challenging for students to create the detail. This group of students identified that Tinkercad had pre existing revolvers that they could have used however the intention was to replace with original student designs. Issues: Detail on the designs related to the size of the items - there were some items that required considerable detail and others did not. Timeframe: The size of the six items to fit for their use in the game meant that under a regular print the print time was 70 minutes. Size: Each of the items was of various size from 4-5cm with a width of between 1cm and 2cm. Process: designed on paper to start with, created in Tinkercad. Converted to Cura and printed using Ultimaker 2. 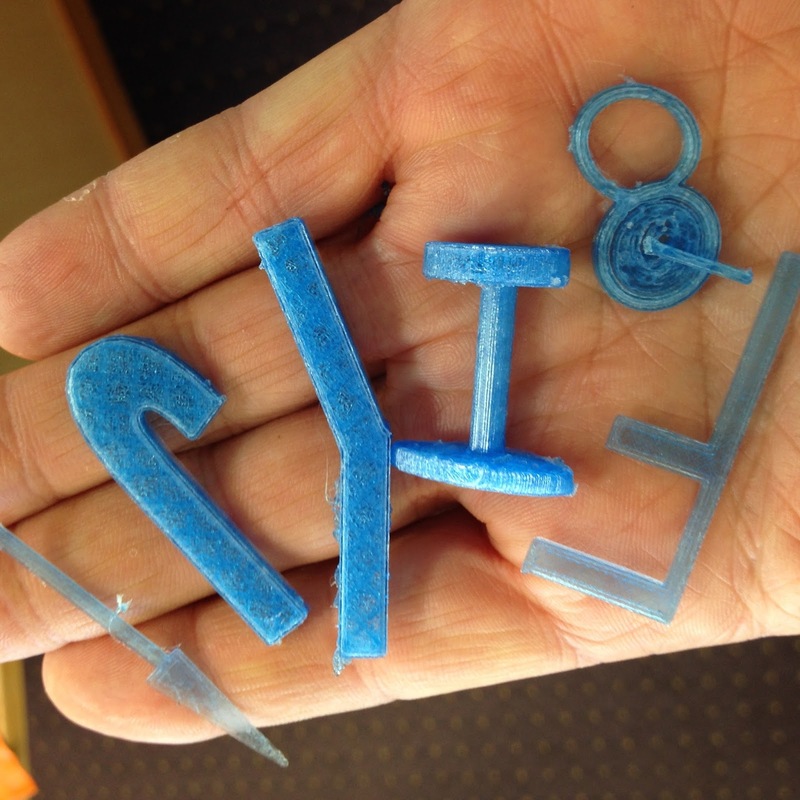 Moving Forward: Replacement game pieces has potential to be a good introductory task for 3D Printing in the classroom. It is a simple practical task (although it must be noted the difficulty of some of the items varied greatly) that would allow something to be used in the classroom and therefore could be particularly ongoing task. Learning Challenge: To use the 3D Printers in conjunction with the EVO Robotics as part of the school technology program. The task was for the students to design a Golf Flag as a target with the idea that the robot would be able to launch a golf ball into it. Background: Auroa Primary School hosts its own technology program and in an attempt to integrate the 3D Printers in use in another area of the classroom program it was combined with a task involving robotics. Students have technology every Friday from 9am until 2pm for half of the School year. They have five week blocks at each of the four key areas (Sewing, Food Technology, Robotics and Woodwork). Last year the 3D Printing Technology was a stand alone program that resulted in the 3D Printed Speakers. Task: Students had to create (using Tinkercad) a 3D Design for a Golf Flag/hole that was suitable for a golf ball to be rolled into. 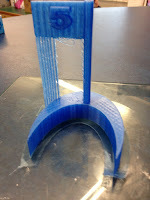 Level of Difficulty: Low - this design was the particular students first ever using Tinkercad and was completely independently with another student providing limited assistance. Issues: The size of the target for the golf ball to enter was an estimation. There are other designs in the series where the target is too narrow making the task extremely complex. As a bonus this tee would be excellent for general practise with golf putting. Process: Template designed in Tinkercad. Students then edited design (with another students assistance. 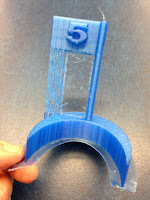 Converted to Cura and printed on the Schools Ultimaker 2 3D Printer.